"Ukraine views such intentions as an unfriendly step." 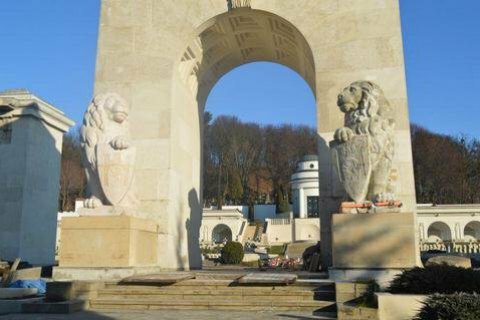 On 7 August, the Foreign Ministry of Ukraine summoned the Polish Ambassador to Kyiv, Jan Pieklo, to express protest against the placement of the image of the Eagle Memorial at Lviv's Lychakiv Cemetery on the pages of the Polish passport. "Ukraine views such intentions as an unfriendly step that adversely affects the development of a strategic Ukrainian-Polish partnership," the ministry in a statement. "The assessment of historical events is for historians. Ukraine opposes the politicization of certain historical facts that would harm the development of a mutually beneficial strategic partnership between Ukraine and the Republic of Poland," the release said. Poland has announced plans to issue passports in a new design by the 100th anniversary of its independence in 2018. The pages of the document will feature places historically important for Poland. One of the possible images is the Eaglet Memorial in Lviv. The Lviv Eaglets fought against the army of the Western Ukrainian People's Republic in 1918-1919. Their memorial complex in Lviv is an important element of the Polish nationalist discourse and a symbol of the "Polish Lviv".